and directed them not to tell this to anyone. This work is one of three versions of the event painted by Bosch, with the others residing in Ghent and Vienna (though the attribution of the Ghent painting has been questioned). 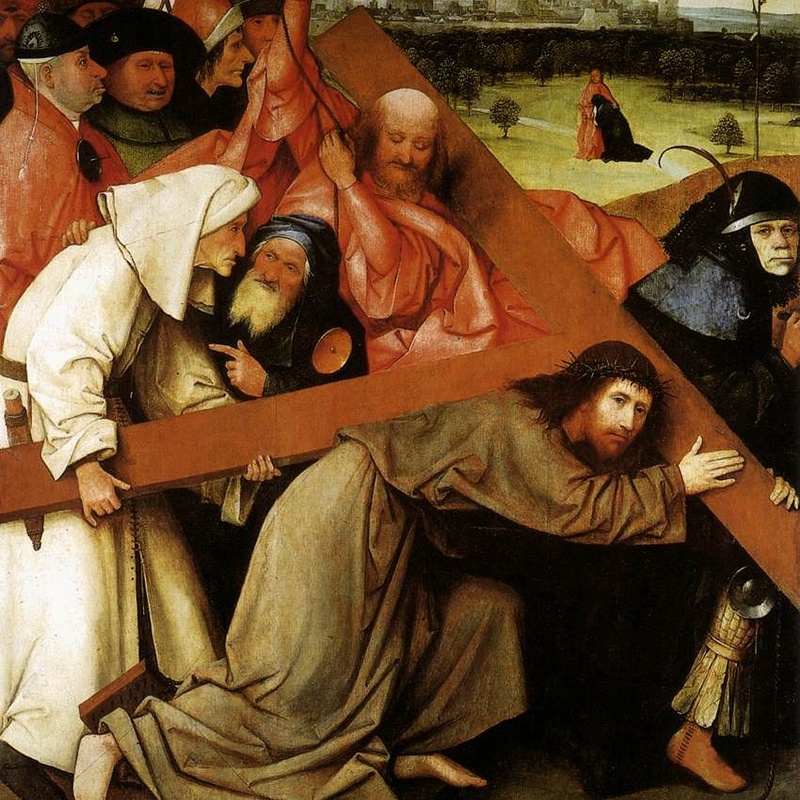 In the Madrid version we see a simple composition with Christ at the center struggling under the weight of the Cross, while Simon of Cyrene tries to assist him. The crowd at left are Christ’s accusers and tormentors, painted as ugly caricatures to indicate their sin in executing the Savior. In the distance above Christ’s head we see a contemporary city from Bosch’s time, and the figures of the apostle John comforting Mary, the mother of Jesus. The guard to the right stares out at the viewer, which is often a device by which artists include their self-portrait, though I could find no literature substantiating this here. It may simply reinforce the stare of Christ, meant to challenge the viewer to take up his or her own cross and follow Jesus. As such, it is a powerful devotional image to use in meditation. This older post remains one of my most popular. Since today’s readings are about God as the Good Shepherd, I thought I’d share it once more. 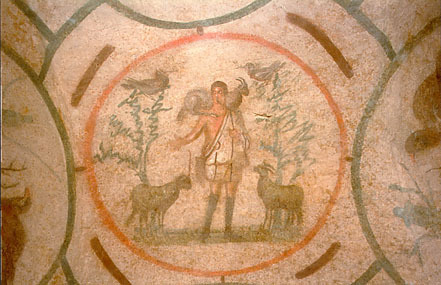 Does your idea of Jesus include the image of the Good Shepherd? Paintings and sculpture of this figure date to ancient times and the Catacombs of Rome contain about 150 such images, showing that this was certainly a popular portrayal of Jesus for early Christians. When I’ve given presentations on the art of the Annunciation, the painting that is most universally admired is the version by the African American artist, Henry Ossawa Tanner (b.1859-1937). People appreciate it perhaps because of its realism, the beauty of its warm golden light, and the humanity and humility with which Tanner portrayed the teenaged Mary.